JSSC Inter Level Admit Card 2017 Typing & Non-Typing Posts - Jharkhand SSC LDC, Panchayat Secretary, Revenue Clerk & Amin Exam in October 2017: JSSC Intermediate Standard Combined Competitive Exam 2017 Exam date announced. Jharkhand Staff Selection Commission (JSSC) will now conduct direct Mains Examination for JSSC Inter Level Recruitment 2017. They are all set to conduct written mains examination for filling up various LDC, Clerk and Panchayat Secretary, Revenue Clerk and Amin vacancies. 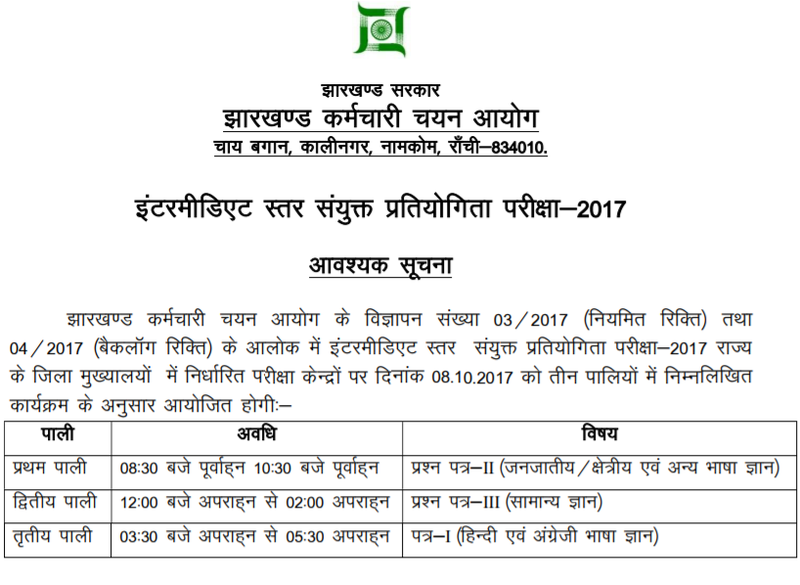 Jharkhand Govt will now conduct direct JSSC Inter Level Mains (ISCCE-2017) examination on 8th October 2017 and (IS(CKHT)CCE-2017 Examination in January-February 2018. Admit Card is available for download. As per the JSSC Inter Level Admit Card, Written examination for Jharkhand Inter Standard CCE (Typing & Non-Typing posts) has scheduled to be held on 8th October 2017 for the post of Lower Divisional Clerk (LDC), Panchayat Secretary, Revenue Clerk & Amin posts. As JSSC Inter Level exam will be held in October 2017, here is everything you candidates should know about JSSC Inter Level exam 2017. 1. JSSC Inter Level Non-Typing Post Exam Date: 08 October 2017. 2. JSSC Inter Level Non-Typing Post Exam Date: January - February 2018. When JSSC Inter Level Exam will be held? This is the questions Jharkhand SSC Candidates are asking who has recently applied for JSSC Inter Level Recruitment. Finally good news for them, JSSC officially announced Inter Level examination date. As per the news, JSSC Inter Level Non-Typing Post examination will be conducted on 10th October while JSSC Inter Level Typing Post exam will be held in January- February 2018. Candidates are hereby recommended to keep preparing for JSSC Inter Level Preliminary exam. Downloading of JSSC Admit Card: October 2017. More Details: Candidates are advised to be in touch with W3i.iN, we are here posting more detailed information about JSSC Jharkhand Inter Level Examination 2017.